Most people associate glass art with elaborately coloured vases or bowls. Sculptures made from this fascinatingly transparent material are currently rather rare - which makes the objects created by Almut Flentje even more remarkable. Some of them seem to have figures or surreal landscapes embedded inside them. Other tell evocative stories. 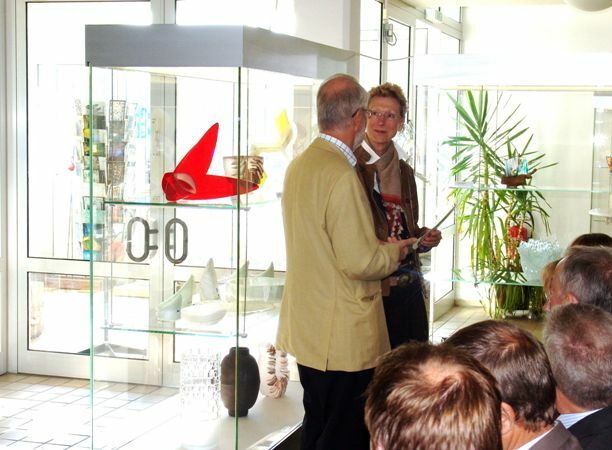 The artist, who has had her studio at the Künstlerhof Frohnau ever since 1999, began her career working with ceramics. That explains why her works, which frequently stand on wrought iron feet, appear to have been formed by hand and why they still feature many ceramic details. Only rarely does Almut Flentje focus on the fluid qualities of glass; instead, she constantly experiments with the limits imposed by the material: melting it down into threads, turning it into droplets, casting wire and speckles of colour with the glass. Ultimately, light plays an important role. It is caught and refracted by the glass objects, making them shine from within. The complexity of these processes can be easily intuited as every step appears to be frozen, as if within a crystal. Christiane Meixner & Marc Leijendekker, “Lust am Experiment – In einer gemeinsamen Ausstellung im Kunstforum der Berliner Volksbank zeigen Gestalter aus Paris und Berlin ihr Können“, in: Der Tagesspiegel, April 3, 2014, pp. 24-25. Her choice of motifs alone speaks volumes: ships and more ships, intarsia structures embedded in glass, as if in amber, skilfully woven wire - we are truly in the realm of “archetypes“. ‘Glass & Keramik Art‘ is her personal response to a wide variety of impressions and experiences gleaned from her travels around the world. The play of colour, untitled memories of light. There are a number of very beautiful works, ‘Coming Home‘ for example, four figures on a “lead“ made - like a number of other pieces - using the rare “pâte de verre“ technique. She is a patient and curious artist with a keen interest in experimentation - all the more reason not to simply fall in love solely with the variety of techniques on display. Gerold Paul, “Wächsern, gläsern, elliptisch - gelungenes Zusammenspiel: Malerei, Glas und Schmuck in der Galerie Töplitz“, in: Potsdamer Neueste Nachrichten, October 6, 2008, p. 26. Almut Flentje experiments with both glass and ceramics, working with the consistencies and properties of her materials with relentless intensity and an ever-changing variety of techniques. She is interested in the transparent qualities of glass and these frequently represent a focal point in her work. Reading the descriptions of the different processes involved, especially the highly complicated firing processes, one forms the impression that glass is a living being that requires understanding. Almut Flentje's creative will is inexhaustible. The fascination exerted by her piece ‘Places of Strength‘ lies in its simple, almost archaic shapes and the tension between the compact dark ceramics that act as a plinth for the glass crown, and the light transparency of the glass itself. The work emanates a mysterious attraction, like a relic of a bygone age. It hints at hidden narratives. Or it might well be a shrine or cult object. Nobody knows. Cornelia Gerner, ”Kunst und angewandte Kunst - Zu den Arbeiten von Almut Flentje, Gudrun Weweler und Christine Sinner“, in: Ausrichtungen, Exhibition catalogue Schwartzsche Villa, Berlin, Berlin 2002, n.pag. They are frozen inside the glass, and yet these primeval crustaceans created by Almut Flentje appear to be alive. These objects hold a fascination similar to that of a fossil encased in amber. Every detail is visible, but all of it solidified a long time ago. Since 1998, the artist has focused on kiln-formed glass with material inclusions. The light falling through the resulting pictorial panels allows them to unfold their full effect. There is always something archetypical about them. The work ‘Ancient Horseman‘ resembles a Native American cosmos. Almut Flentje constantly opens up new spheres of thought. Glass is gathered in dew-like drops inside a glass cocoon, drips out of a painting or is embedded like a precious stone in raku ceramics. Jack Rodriguez, ”Grenzgängerei“, in: Neues Deutschland, June 14, 2002, p. 17.